“Medicine Drops” Charms. $50 each. SOLD. Medicine is given to us as the rain: tiny drops infused with power and spirit. Wings pays tribute to the power found in small things with a set of sterling silver charms, each stamped with a different traditional symbol. 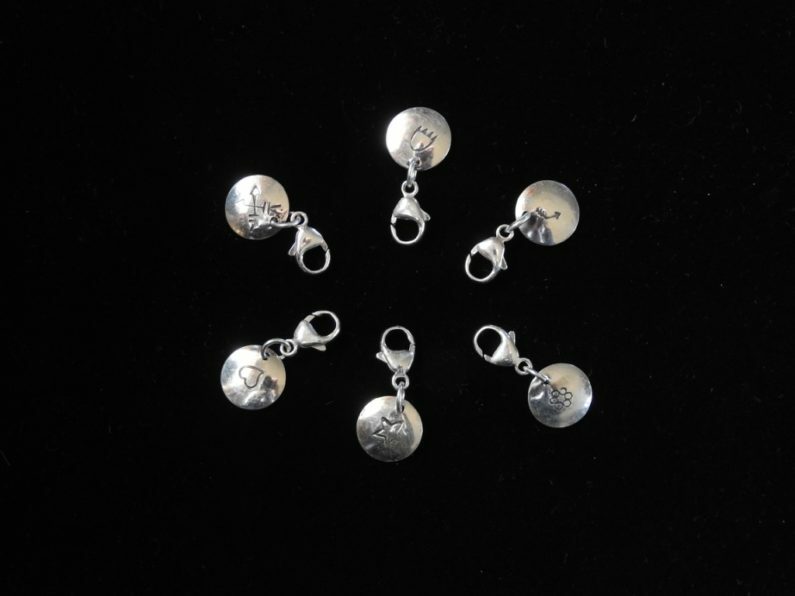 Each is formed of a single perfectly round concha approximately 3/8″ across, lightly domed repoussé-fashion, a hole drilled through the top and jump ring attached to connect it with a silver lobster-claw clasp. Each has a single symbol stamped in the center of the front, then repeated in the center of the back. The symbols and meanings are listed clockwise from top: Bear Paw (medicine, protection, strength); Broken Arrow (guidance, change in direction, peacemaking); Cactus Blossom (life, growth, abundance); Five-Pointed Star (celestial power, illumination, guidance); Dancing Heart (love, joy, a nurturing spirit); and Crossed Arrows (direction, protection, steadfastness). Wings first created these as part of a set offered for a particular promotion at a special price; these six remain, and he has decided to keep these six each at the same low price. All content, including photos and text, are copyright Wings and Aji, 2016; all rights reserved. Nothing herein may used or reproduced in any form without the express written permission of the owners. Posted on Saturday, December 3rd, 2016 at 7:22 pm. Filed under: Accessories	RSS 2.0 feed.